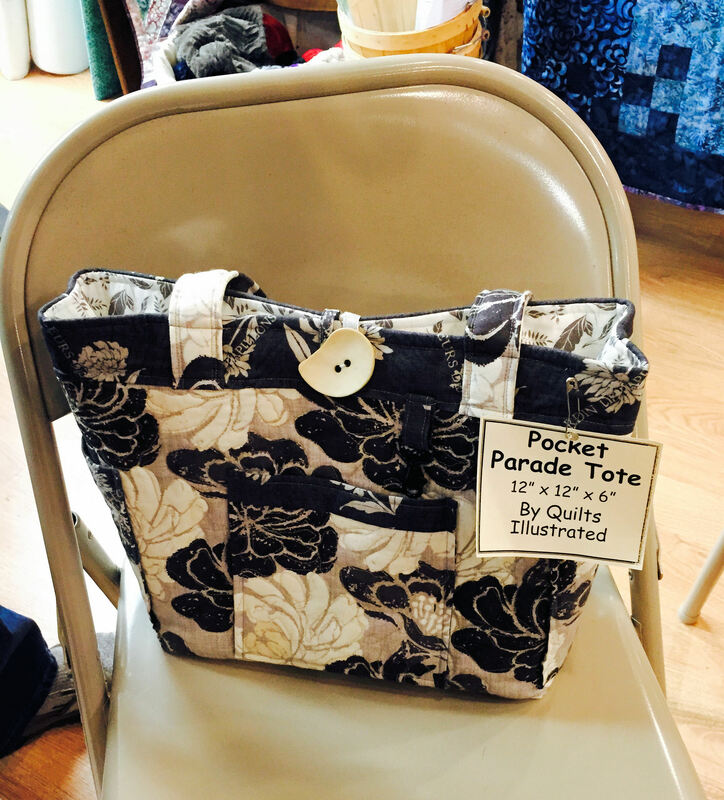 It’s that time of year again when one of my local quilt shops, Quilter’s Cupboard, holds its annual Purse Party and introduces a parade of purse, tote bag, travel-and-accessories bags, and just-for-fun sewing projects, as well as related sewing notions, hardware and fusible products. This was the fifth year that owner-designer Cindy Peters held this popular event. Today, however, one of her employees, Sandy, had to fill in for her when a medical matter in Cindy’s family took her away from the shop. Sandy spent the better part of the day alone, but a few of her co-workers happened to be shopping in the store. They simply clocked in, rolled up their sleeves, and began doing what needed to be done. Sandy discussed and passed around various finished bags and other projects, provided sewing tips, and suggested how each item could be used. Naturally, not all of them appeal to everyone, but I’m going to highlight a few that I especially liked, and provide links to where you can find these patterns. Let’s start with a couple of patterns that Cindy Peters designed. “You can never have enough tote bags,” said Sandy as she shared Cindy’s Purse Party Tote. She explained that the fabric shown in the photo sat on the store shelves for the longest time until it was used for the Purse Party Tote, at which point it completely sold out. You can purchase this pattern by contacting Quilter’s Cupboard, and the store will mail it out to you. 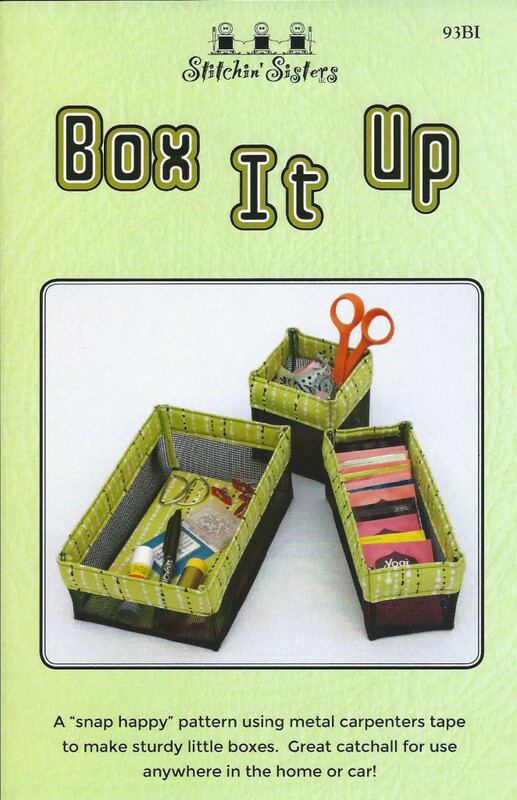 Next is Cindy’s Box It Up Easter Basket, adapted from Box It Up by Stitchin’ Sisters. 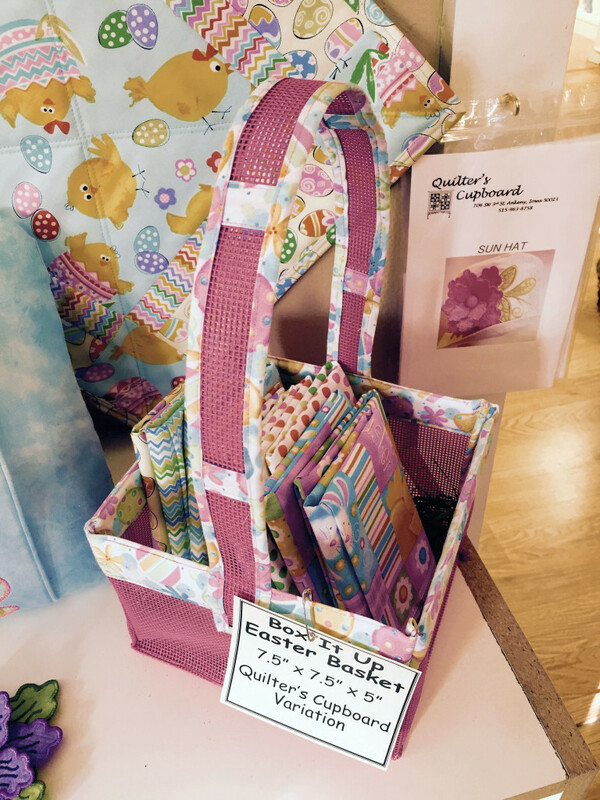 The Easter basket is made with pet screen vinyl, fabric, and a carpenter’s metal measuring tape. When my husband saw the pattern, he told me to stay away from his workbench. Along the same line is the inspiration for the above pattern: Box It Up by Cheryl Von Ruden of Stitchin’ Sisters. The pattern includes instructions for all three sizes of these clever catch-all boxes. Because all of the seams are enclosed in fabric, you can turn the boxes inside out, and they look wonderful. I fell in love with the Diva Frame Wallet, designed by Jessica VanDenBurgh of Sew Many Creations. This super-skinny wallet can be sewn with more formal fabrics or fun prints for a more casual look. It utilizes an eight-inch wallet frame, which is available from Amelia’s Garden. You’ll never find a structured tote bag with as many pockets as Pocket Parade Tote, designed by Penny Sturges of Quilts Illustrated. 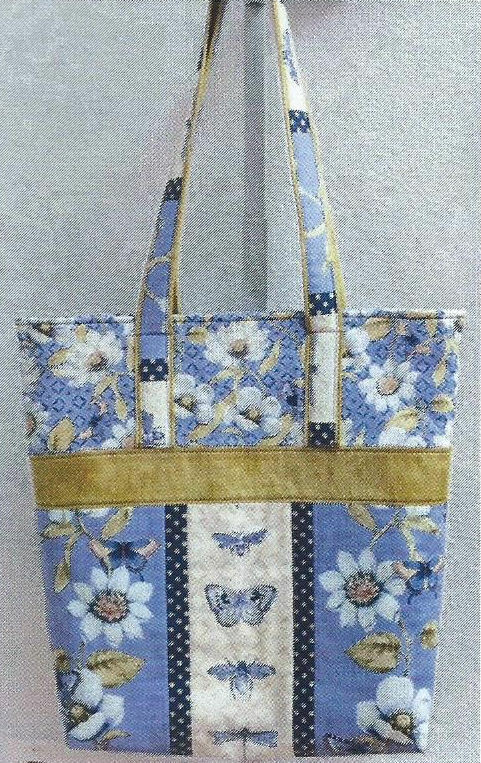 The sample we admired at the Purse Party featured fabric that was quilted first, then incorporated in the bag. 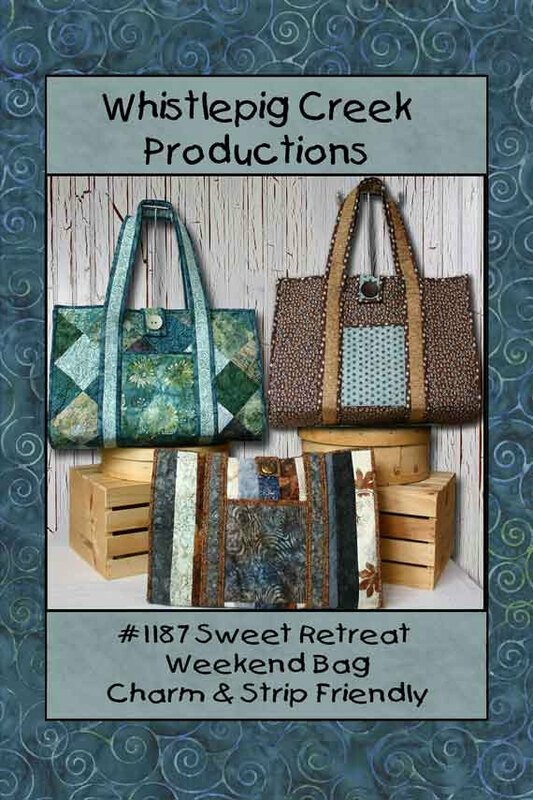 Susan Marsh of Whistlepig Creek designed a Sweet Retreat Weekend Bag that is the largest retreat bag I have ever seen. I can imagine taking this bag to a craft show, filled with purchases if I’m a buyer, but with my own products if I’m selling and doing booth set-up. 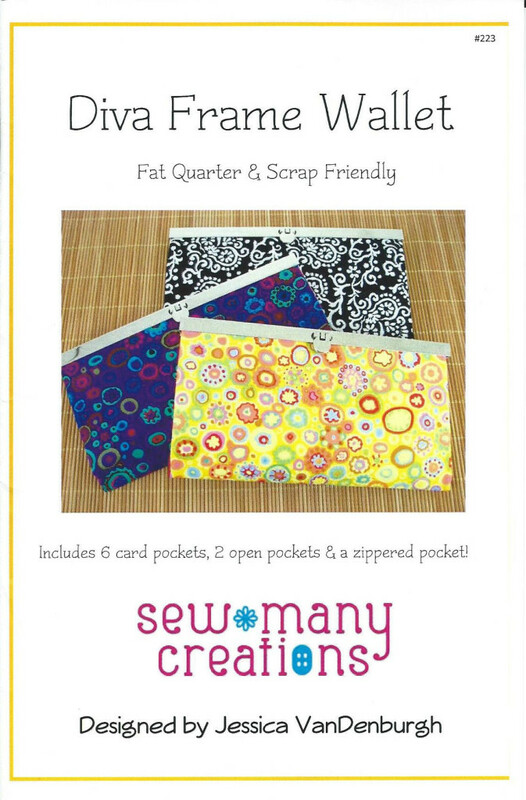 If you like sewing with charm packs or jelly roll strips, you can incorporate them real well using this pattern. 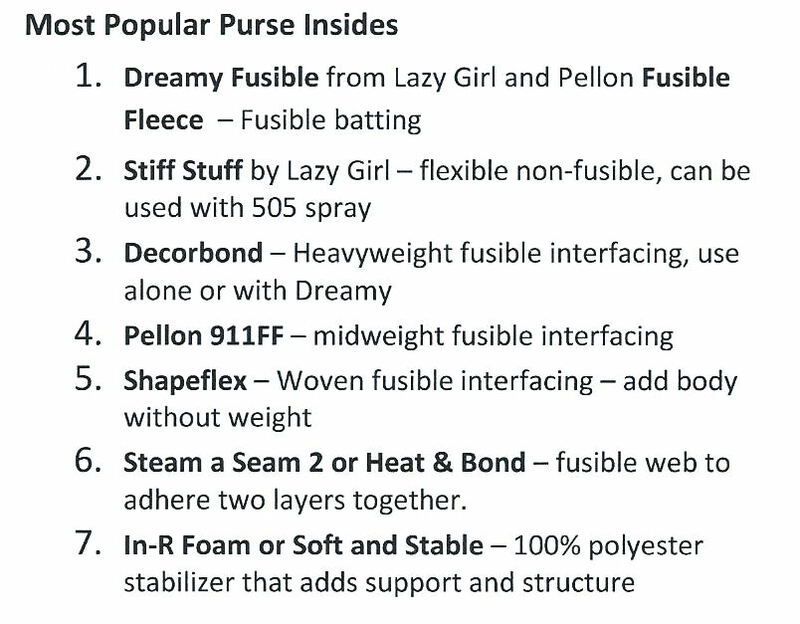 One of the useful things that was shared at this year’s Purse Party was a list of fusible products that work well with bags, which I find quite helpful, especially because these are products that my quilt shop carries. Often patterns will recommend fusibles that you can find only on the Internet. Do you enjoy sewing bags? Do you collect patterns and fabrics for this purpose? I suspect I have more of both items than I can ever use personally, but I’ve convinced myself that bags always make great gifts. Ha! © 2015 Judy Nolan. All rights reserved. Love the boxes! Those would be very handy to collect all the things that tend to pile up on my work table and desk!